In this illustrated guidebook, Peru's premiere spiritual tour guide, Jorge Delgado, takes the reader on a trip of discovery through the most powerful and mystical places on earth - Machu Picchu, the Sacred Valley, Lake Titicaca and the magical Inca doorway of Aramu Muru.Jorge Delgado was born in a small Andean village in Peru. 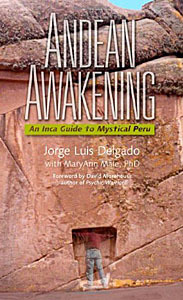 In Andean Awakening Delgado opens the door to his mystical homeland as he describes his own journey of awakening and packs his personal narrative with fascinating details about Peru, its history, culture, mythos and magic. Delgado is our personal Quechua - a bridge person who helps others to cross from one state of conscious to another. Delgado bridges readers to the spiritual power of the Andes, of Peru and legend of the Inca - the return of the children of the light. Jorge Luis Delgado, born in the highlands near Lake Titicaca, Peru, is of Aymara Incan heritage. His mother is from a family of herders and his father was a teacher. Growing up in a large family in Puno, Peru, Jorge Luis began carrying bags for people in Puno to earn extra money for the family. After he graduated with superior grades from high school, Jorge Luis continued in this tradition and chose to be a tour guide. Early in his career, he concentrated on being very scientific as he worked in the area of the Sacred Valley, including Machu Picchu, and the area surrounding Lake Titicaca. Today, Jorge Luis is known around the world as a knowledgeable guide of the Sacred Valley and the High Plateau of the Andes. His knowledge spans the culture, the traditions, and the spiritual heritage of his vibrant Inca world. Jorge Luis now has his own tour company, Kontiki Tours, and is currently building his third Taypikala Hotel. Most important, Jorge Luis is a "chacaruna," a bridge person, who assists people in connecting to their spiritual self within their own traditions. Jorge Luis lives in Puno with his wife and three children. MaryAnn Male, PhD and her husband, Theron, first traveled to Peru with a small group in August, 2000 and met Jorge Luis, their guide. It was on their second trip to the Andes that MaryAnn and Theron asked Jorge Luis to share his wealth of knowledge with the world in a book that would present an authentic Inca voice about his beautiful heritage. They traveled with Jorge Luis, met many of his teachers, and began recording his thoughts and his celebration of life. Since 1985 MaryAnn Male has been a practicing licensed psychologist with a specialty in trauma response. Jorge teaches on Realizing the Power of Love, Wisdom and Service: A teaching of the Inca culture from Jorge Luis Delgado during the 2012 Hearts Center community pilgrimage to Lake Titicaca, Peru. Are you a child of the sun? Jorge with us at the Interdimensional Gateway on Day 8 of our Peru Pilgrimage.